Samba Hit III, bay Berl.-Brand Stallion by (Sandro Hit / Poesie [Brentano II ]), born in 2003, standing approximately 16.3 hands. An exceptional modern dressage horse, Samba Hit III has fantastic movement and great rideability; he was awarded with 9.0 at his 30 day test. With regard to the quality of his gaits: his phenomenal walk, his graceful trot which swings through his whole body and a rhythmical, uphill bouncy canter combined with exemplary rideability put him amongst the best in his age group. Samba Hit III full-sister to Poetin, the double champion and World Young Horse Dressage Champion was auctioned for the record price of € 2,5 million at the P.S.I.-Auction in Ankum. 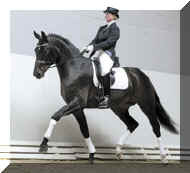 Full-brothers Samba Hit I has won many dressage competitions up to Intermediate I level and produced the approval champion at Berlin-Brandenberg. 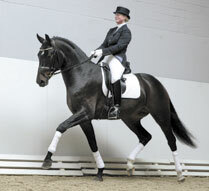 Samba Hit II is also a champion and competed successfully at the riding horse national young horse championships 2006. Poesie’s dam lineage has experienced outstanding success and is managed at the Brandenburger County Stud in Neustadt/Dosse. Due to his talent as a dressage horse and his genes, Samba Hit III future knows no boundaries. We very much look forward to his first foals.